JENNY WILEY was a young wife and mother in 1780s Virginia when a band of Native Americans attacked her farm, killed her children and dragged her hundreds of miles, across rugged hills and swollen rivers, to the wilderness of present-day Eastern Kentucky. Her story of sorrow and survival became the stuff of legend, a tale passed from one settler to another as a warning and from one generation to the next as a testament to the hardships and bravery of the Big Sandy Valley’s first settlers. But where does the history end and the legend begin? 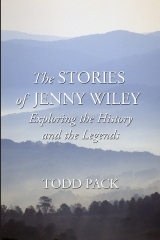 THE STORIES OF JENNY WILEY (coming soon from Story ATOM Media) is the first book to not only separate the threads of history from the broadcloth of legend but also to look at the historians and storytellers who have carried her memory into the 21st century. Purchase the book from Amazon or directly from Storyatom.